These pictures are so gorgeous I broke my rule again. Left em BIG. So be patient. Would make good wallpaper. 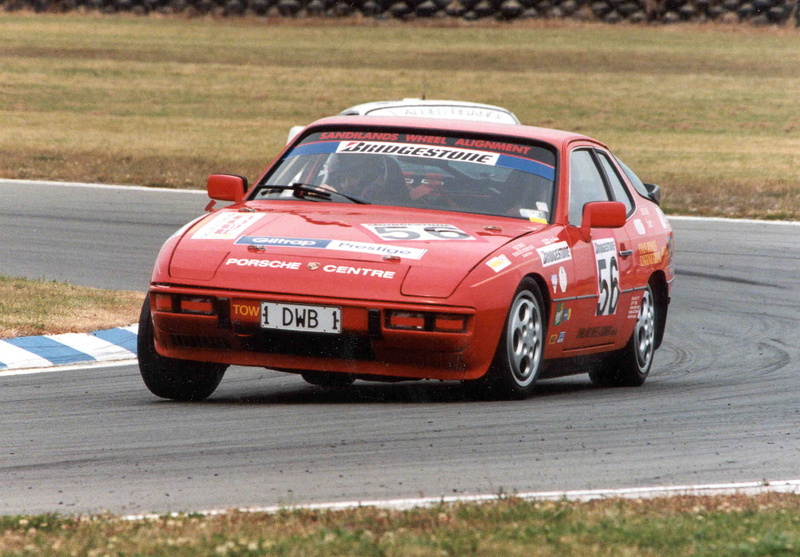 The Grand Prix series in NZ is sanctioned by Porsche in Germany to be run under the rules the same as they do in England. We in NZ run 7 classes all in one race, i.e. we have up to 35 cars on the start grid at all the national events. 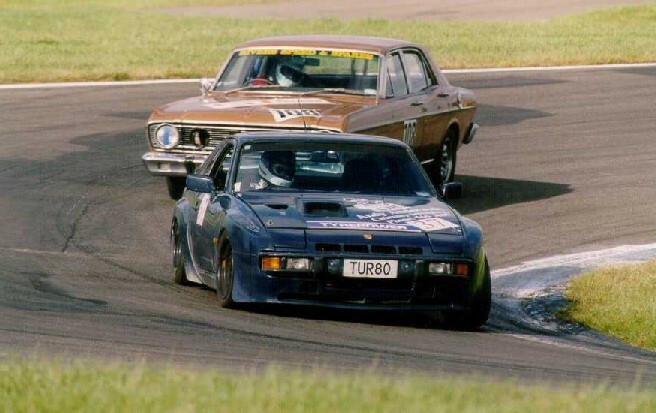 Class A is 911 cup Carrera 3.6 L B is 911 RS spec3.2 & 2.7 Litre class C is 911s & sc 204hp class D is 924 turbos & 911sc 180hp class E is all 944 & 924's Supercup Turbo class are 911 Le Mans 3.6 litres and finally Super cup Non-Turbo are 911 RSR and any Porsche modified outside the original German specs ,my car runs in the Super Cup Non-Turbo Class but I basically race with all the 924 and944 at the rear of the field. 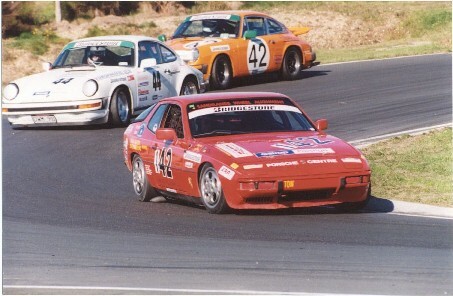 The series is the Bridgestone NZ Porsche Championship and It runs at the NZ Grand Prix race meetings. I am running out of time will call again after this weekends race meeting at Mansfield Race track 6th round of the championship. 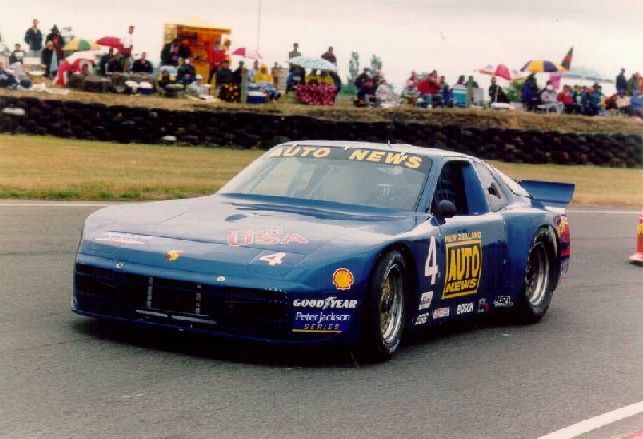 In regards to our cars being more powerful we run hotted euro spec engines, no air control in NZ required, we can run our race cars on the road just as you have seen in the photos but not with our race numbers on i.e. no insurance, to run my car on the road lowered hot cams weber carbs roll cage race seats and belts and all the sponsors on I have to be certified by a Transport Engineer and carry a special motor sport of NZ certificate for the police remember we only have 3 million people in NZ and we are all petrol heads. 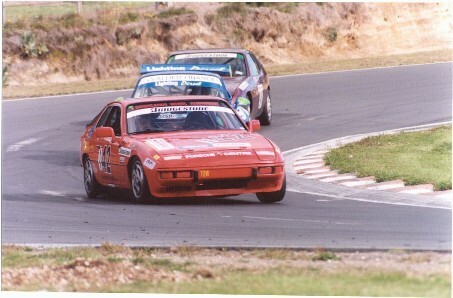 In NZ there would not be any more than say 50 924's running so over here a porsche is very special. 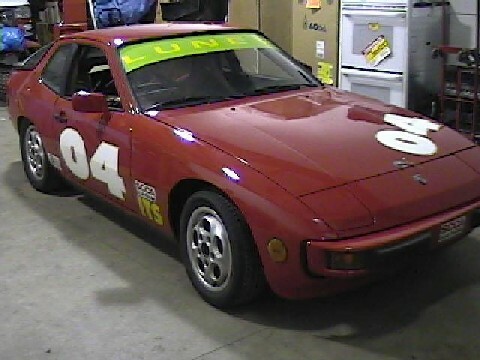 My car runs out at 130 HP I run the car on AV gas 100% octane we buy this from the local airport and of coarse the race tracks. 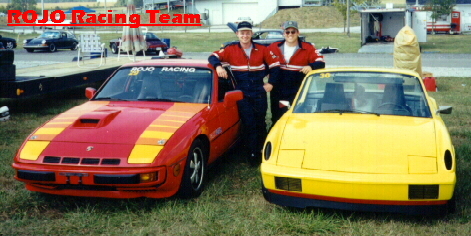 John's car was originally built by the factory rallye team in the UK as a Carrera GT replica. It now has 260,000 miles! 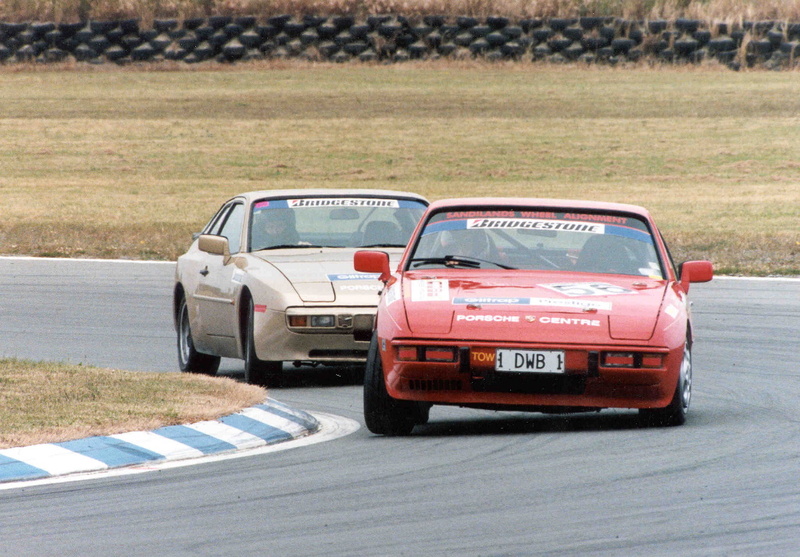 Robert Curchman and a co-conspirator race in PCA. 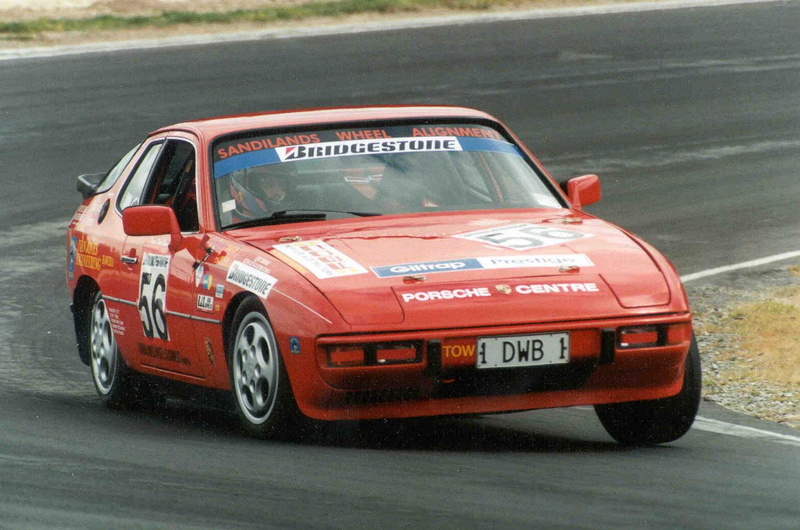 "I'm racing a '80 924 in the NZ Porsche Bridgestone series, and having loads of fun." 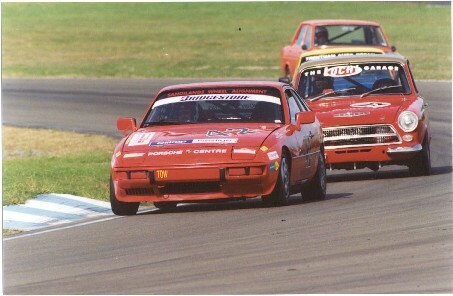 I have to admit I was the chap who spun at the Russell chicane at Snetterton, and faced the pack on two successive laps. I can only tell you, the in-car video ( all my races are on video - brilliant quality from the Sony DV's )was a bit eye-watering! What really upset us, is that I was lying third at the time. What happened was that we lost the electrical charging system during the first race - but didn't notice until the car refused to start for the second! 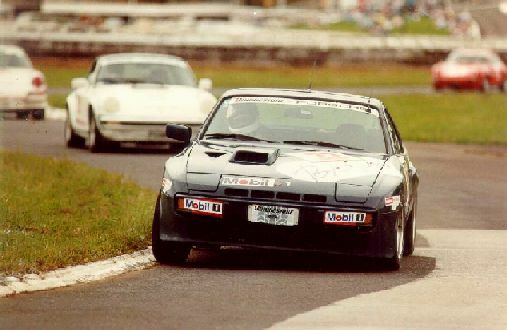 By then, the battery was nearly flat ( we had to run wipers and lights 'cos there was a torrential downpour in the resumed first race - 100 mph blind into spray is a bit interesting ), so we knew the car wouldn't last the race. Anyway, a race costs us 100 uk pounds, so we push started and went for it. I'd finished 4th in the first, so hoped for something for at least part of the second race. 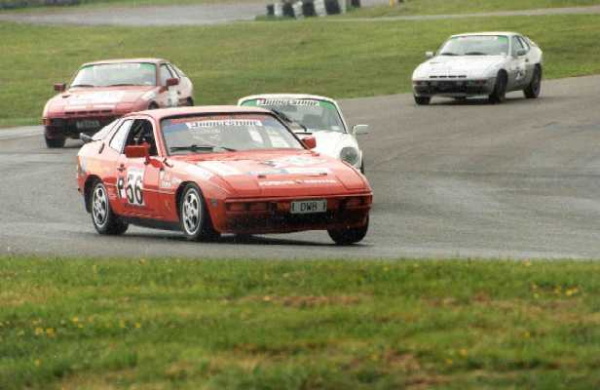 I got from 6th on the grid to 3rd, but going into the chicane after the 100mph Coram Curve ( a right hander - we race clockwise here ), the engine just died and racing 924's simply swap ends on a dead throttle. Hence , the "interesting" wait to be pushed clear! 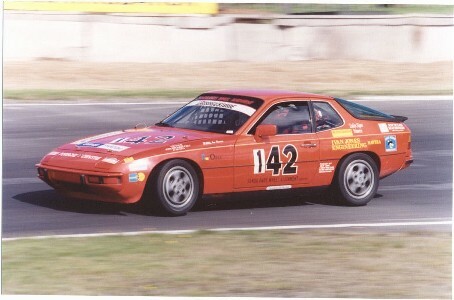 If any of you want to race in the UK 924 series - mail me and I'll tell you more. It's a brilliant series to start racing in - we have around 60 registered and up to 34 turn out at each race. 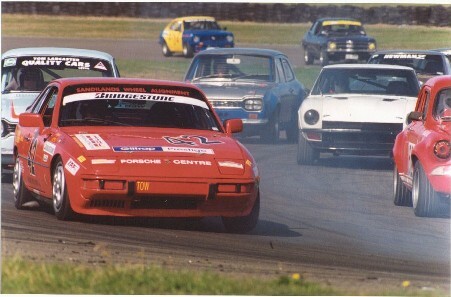 More info on http://www.pages.eidosnet.co.uk/mfletcher/pda/ or http://www.dialspace.dial.pipex.com/pdpr/colway/porsche924.htm We reckon our car has the best handling chassis in the series, a good engine and an ok driver (me!) - so I'm the bit where most improvement can come from. 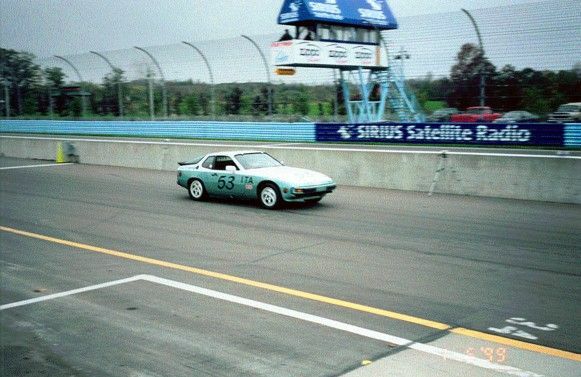 The 924's are brilliant handlers - our data acquisition says we are pulling about 1.2G in the curves and we can keep up with a lot of fancy race machinery ( like 360 Ferrari's )in the corners, provided they are not running downforce. They do, however, disappear on the straights! 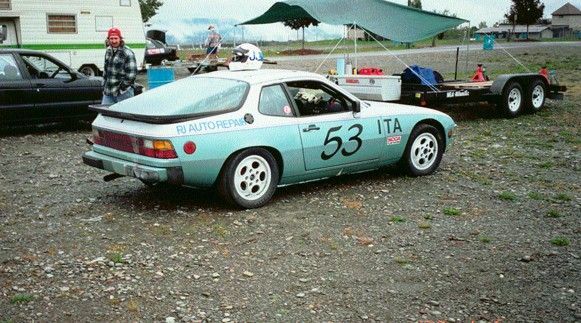 Latest project is a 924 Carrera GT (genuine) I just bought, which needs some attention - that's why I started reading this site. 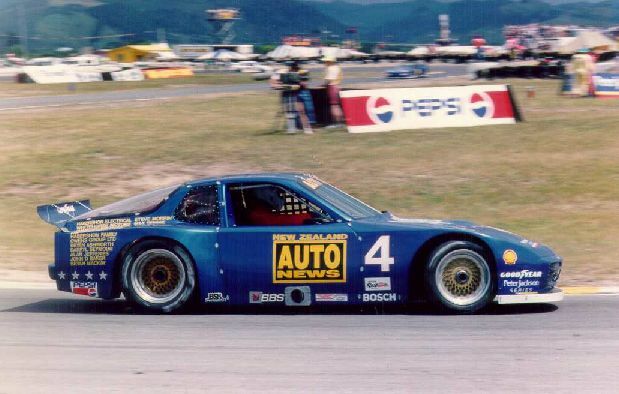 Anyone got a front end PU for the GT? There are no repacement PU available as far as anyone knows from the factory the best alternative is fibre glass or maybe carbon fibre, expensive but as near as we can get to PU.